The Kona Montessori School commissioned landscape designer and muralist, Calley O’Neill to design a landscape in memory of a young boy, Nick Van Pernis. The wish to create Nick’s Garden inspired an entire landscape, a lively schoolyard ecosystem called The Children’s Garden at Lailani. The mission of the landscape was to show how a plain schoolyard could be transformed to celebrate and nourish children, learning, and the Earth. German dancing chimes, a beautiful musical instrument of nine outdoor bronze tiles that are tuned pentatonically. They have high play and therapeutic value as the sound is beautiful even with heavy jumping. Harmony results from connecting movement and sound. 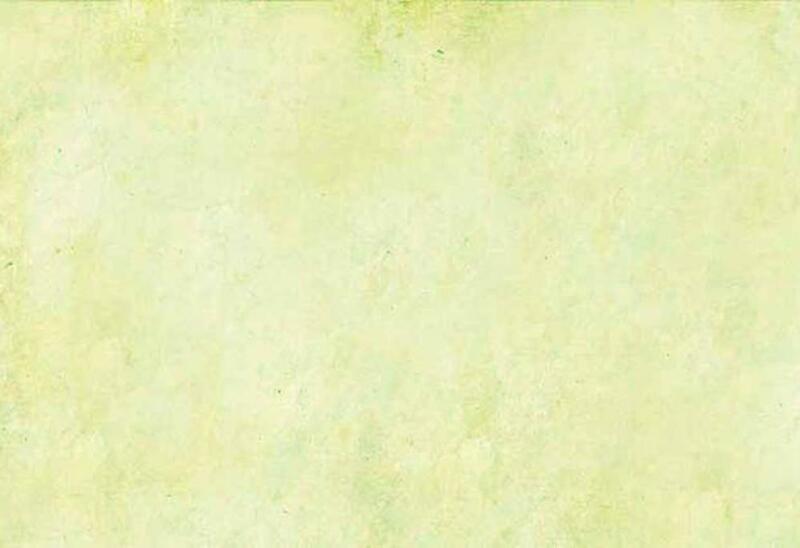 …a transformation to celebrate and nourish children and the Earth. The Children’s Garden at La’ilani is a community based design and participatory strategy to transform a typically flat, dry chain link fenced school yard with some plastic play equipment into a series of small, intimate lush tropical children’s healing/learning/discovery gardens with a wide variety of natural play and discovery opportunities in a creative and affordable way. The beneficial effects of a diverse, alive and nurturing environment have been well documented both in terms of human healing and personal growth and learning. Places release a particular kind of energy in people, and children respond directly, totally, and sensorially to the message of their surroundings fully absorbing its experience. If the surroundings are joyless, rigid, barren and dry, they have a profoundly negative effect on the children, often bringing forth more aggressive and competitive behavior. Our environments dramatically affect the quality of our lives, and will shape the lives of our children. Nature is the area most desperately lacking in both private and (especially) public education today. Children need environment that is rich in experience, play, mystery, bounty, beauty and wonder – and that is what we are seeking to recreate as a prototype for landscape transformation in our public school system through our lively demonstration at The Children’s Garden at La’ilani. We recognize that places are the very terrain from which children learn, and not simply a site they learn in, and that our future and the future of the planet may rest in our children’s nurturing oneness with nature. Learning centers have the potential to shape the future visions of what a society can and should be – abundant, beautiful, safe, healing, educational and miraculous. The accessible gardens will be connected by a children’s obstacle track conceived by Theresa Andrae, the Site Director and 3-6 year olds’ teacher, to encourage walking and running along a particular path, with numerous stops along the way for imaginative play, such as the ‘pier’ and sunken boat with shady colorful said and flags and glass bottom for observing soil life, talking tubes with 3 stations; the lashed hide-out and the Talk Story Sand Box surrounded by foliage (with a canvas awning which comes down at night to keep the sand free of dirt, kitties, and rain). There will be German dancing chimes, and sunken mini-trampolines for irresistible exercise, fun and lymphatic cleansing, where the children can only fall ‘up’ onto the soft Mondo grass berms. A 30’ long balance beam, designed by the staff will be adjustable both in terms of heights, and widths of the beam. It is long and challenging enough to remain interesting and can be used to get from the school to the backhoes and sand bowl, which require considerable easy to learn skill and coordination. Other play opportunities include a shaded tumbling gym (conceived Nancy Haryett, Administrative site Director and 3-6 teacher) swings, ropes, rings, bars and arched challenge ladder, a play center, 4 seat teeter and a ‘tough’ tire course. 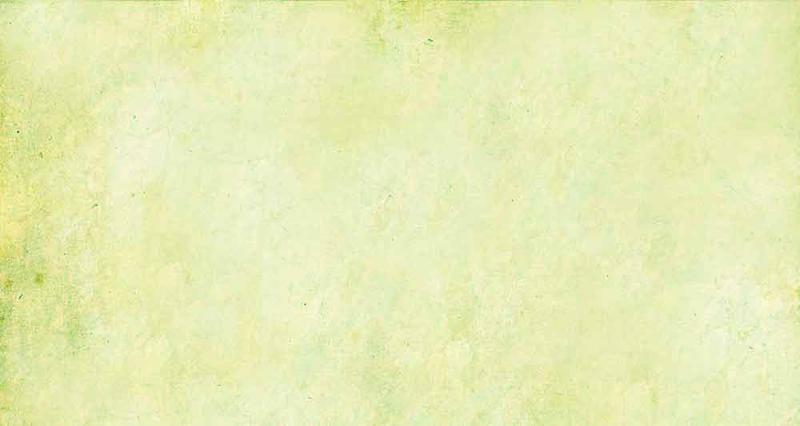 Quieter opportunities include Lemon Lane Village, with a yellow brick circular ‘road’ and homes of plastic, wood, and cardboard blocks that children build themselves in a tiny bermed citrus orchard with perennial blossoming colors of pinks, lavenders and blues. There is a discovery areas for pet turtles, fish, birds, and chameleons under native ‘ohia trees with a raked sand garden, and a Garden of angels for quiet sitting in a tiny garden of pink blossoms and small ‘hidden’ sculptures. There are digging area, native trees and plants, fruit trees and Bio-intensive vegetable beds where the children can learn to grow their own food in an organic and sustainable way. There will be a double composting bin system with bunnies and herb hardens, as well as a tropical stream garden with tiny boats and a covered bridge to stroll across to a hiding place in the curving hedgerow of bananas, papayas, ferns and flowers in easy view of the staff. There are numerous safe water elements throughout the comprehensive garden landscape to enhance this hot, dry environment through site, sound and the cooling, potentiating flow forms and child size dancing waters. The toddler yard has a large covered wooden lanai connected to an adventure house and a creative ball and tube game developed by Mary Colton, the head toddler teacher. as a beautiful wall relief of giant bamboo and clear plastic tubes, and fun coordination /cooperation game. On the large Hawaiian stone retaining wall, we will build a recirculating water fall, to subdue the suburban sounds and bring humidity to the immediate area of the wall so that it can harbor orchids, ferns and bromeliads in pinks, whites and lavenders, just above toddlers’ grabbing height, but in full display from the house and climbing structure. 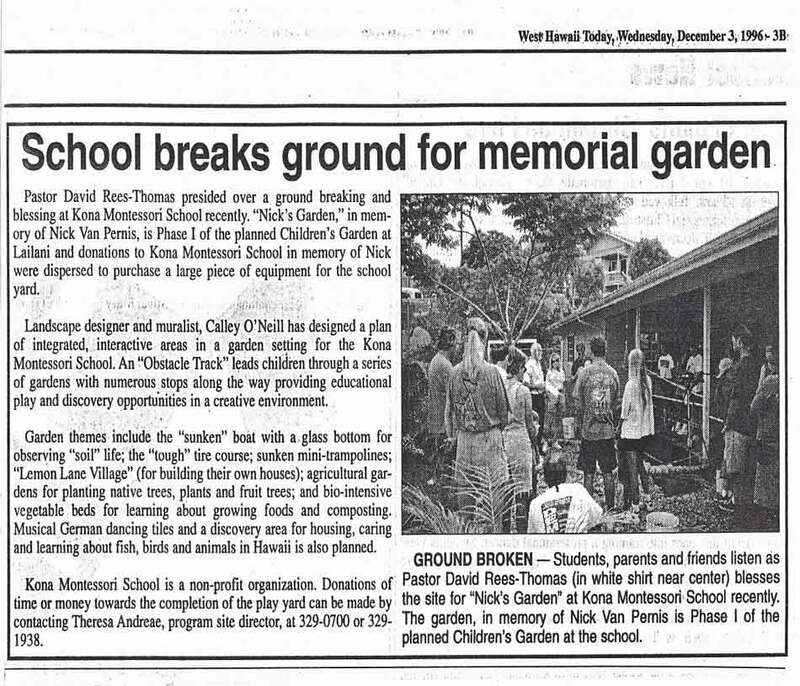 The gardens, designed by the staff, students and designer will be built by the community over a period of a year and a half as ..a transformation to celebrate and nourish children and the Earth, and a visible prayer dedicated to Nick Van Pernis to inspire other schools in Hawai’i to create their own children’s healing gardens. 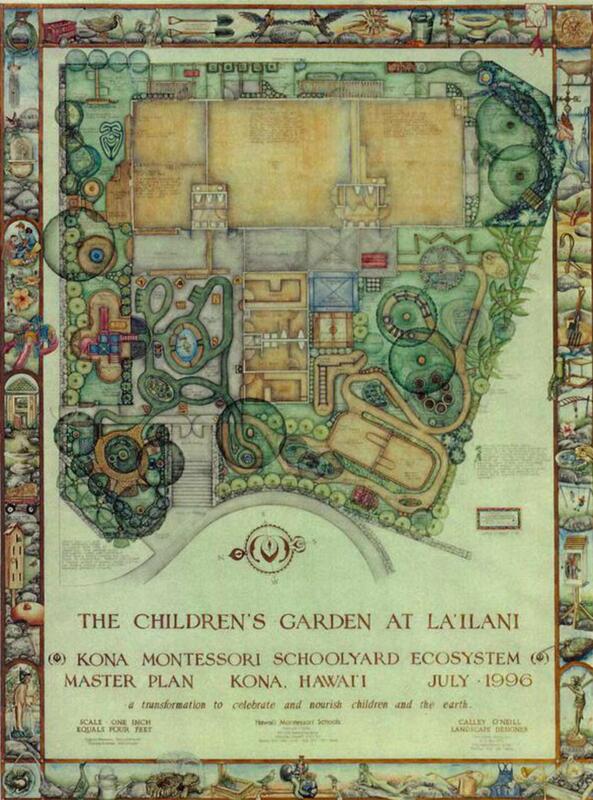 The Children’s Garden at La’ilani will target the entire Montessori school community, including parents, teachers, staff, students and ohana (extended family), as well as the public school system, particularly Waimea Elementary School, which is carefully watching this project, with the expressed desire by the Administration and School community Based Management Council to transform their entire landscape in a similar fashion. This will be a comprehensive, well documented and well publicized prototype for the creation of school yard ecosystems in Hawai’i, which is already having an impact significantly beyond the immediate school community. The school community is demonstrating an enthusiastic interest in building and maintaining these low maintenance gardens for the long haul to benefit the children, the area of La’ilani, their own lives and that of the public school children who will potentially benefit. We will reach about 30 plus families immediately. Each family is required to contribute 45 hours/year of volunteer time, and this project is a very popular choice. This garden is an innovative, comprehensive transformation of a typically dry, flat, fenced school yard into a lush series of intimate childrens’ healing/learning/discovery gardens, which will demonstrate sustainable practices of agriculture and landscaping, food growing, discovery and educational opportunities, imaginative and cooperative, and a deep love of nature on the part of the elders setting the example for our children.